Josh Belliveau says businesses planning holiday parties are drawn to the unique atmosphere of the Basketball Hall of Fame. Anthony Barbarisi recalls the years when large companies would splurge on huge holiday parties for 1,000 employees or more. The Great Recession put a damper on the holiday-party business in general, denting sales for banquet facilities and restaurants across the region. Those very large parties haven’t really come back, said Barbarisi, sales manager at Chez Josef. But, over the past several years, most other types of parties certainly have. The main party trend, he said, may simply be a greater focus on quality and variety of food. 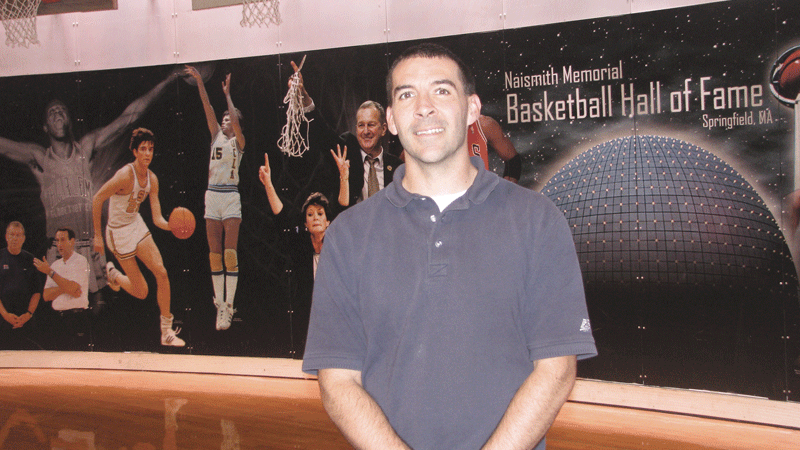 Josh Belliveau, corporate sales/event manager at the Basketball Hall of Fame, said businesses planning holiday parties are asking for the full gamut of options, from formal sit-downs to buffets to cocktail parties with heavy hors d’oeuvres. The Hall handles corporate events for businesses in Western Mass. and Northern Conn., ranging anywhere from 25 guests to 300. Most bring in their own entertainment — DJs or live bands — but many access the facility’s in-house audio system. Meanwhile, Max’s Catering, the Hall’s catering partner, handles the food service. But what really draws many clients, he said, is the atmosphere, with parties hosted on center court, surrounded by basketball history. Speaking of unique facilities, when Vitek Kruta and Lori Divine bought the Holyoke building four years ago that would become Gateway City Arts, they saw something in the dirty, empty warehouse along the city’s canals. Now, the facility functions as an artists’ workspace during the day and an event space on nights and weekends, one with a decidedly artsy, funky vibe. “We have three different large spaces, and we’re just about to finish a fully functional commercial kitchen; right now, our food is operating out of a tiny kitchen space. That will give us the ability to prepare lots of good food,” Kruta said. Meanwhile, he and Divine are opening a restaurant on the site called Gateway City Bistro. Still, Gateway has been hosting events for some time — weddings, fund-raisers, concerts, bar mitzvahs, birthday parties, memorial services, and more, including, yes, holiday parties for businesses. He said the calendar is well-booked into next year, and that the facility hosts corporate parties of all kinds — socials, cocktail parties, and sit-down dinners. One of the event spaces at Gateway City Arts boasts a fully equipped stage with state-of-the-art lighting for concerts and other performances. Meanwhile, a patio Beer Garden and grill area provides an opportunity to host events outdoors as well, and the facility hosts a popular Sunday brunch as well. During the week, the building is full of artists who rent studio space and shared resources, like woodworking and ceramics shops. “We have people here making jewelry, developing toys, puppeteers, painters, writers,” Kruta said. 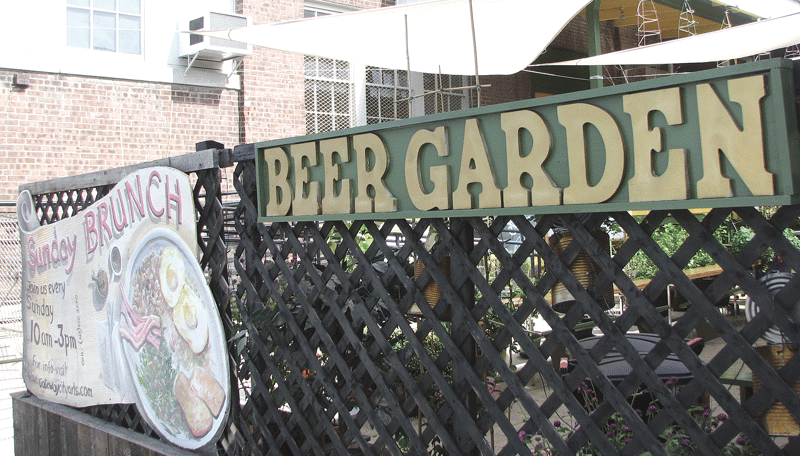 Gateway City Arts’ outdoor Beer Garden is one of several unique, funky spaces the facility offers. He called Gateway a huge addition to downtown, drawing close to 20,000 people a year — some in unexpected ways. For small companies looking for a big-party experience but lacking the budget (not to mention the head count), large, themed holiday parties for multiple businesses at once have become a popular trend at many venues in recent years, including Chez Josef, said Barbarisi. For instance, this year’s roster of parties includes a country Christmas event, with a western-themed menu and entertainment by local country band Trailer Trash; a Hawaiian luau event with a tropical menu, island décor, and music from Jimmy Buffett tribute band Changes in Latitudes; as well as a comedy dinner featuring a dueling pianist performance and interactive singalongs. For its New Year Around the World event, Chez Josef will treat participating businesses and groups to food stations featuring a wide range of global cuisine. Whatever the case — and the facilities who spoke with BusinessWest for this issue all offer something unique from the others — corporate holiday parties are certainly on the rise, and have been for several years now. It doesn’t even need to be an evening-long dinner, he said, as some companies are opting for cocktail parties that last a couple of hours and give their employees a chance to relax in a different setting.